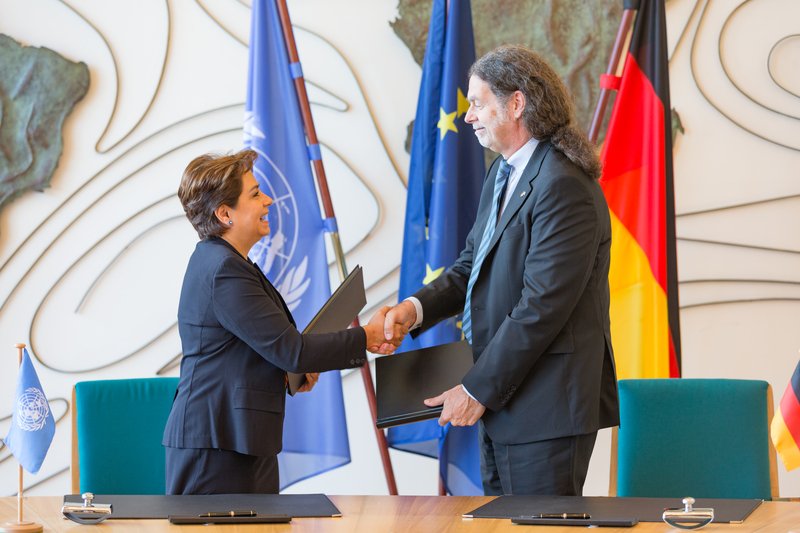 UNFCCC Executive Secretary Patricia Espinosa signs the COP23 hosting agreement with German State Secretary. Photo Credit: UNFCCC. Determining the amount of climate finance received by each developing country is a surprisingly difficult task. The Biennial Update Reports (BURs), submitted every two years by non-Annex I countries, are intended to provide information on this topic. This research suggests that many countries have not submitted their BURs, not complied with UNFCCC reporting requirements, or have used vastly different reporting approaches, making comparisons extremely difficult, if not impossible. This brief is the fourth in a series summarizing research carried out for the 2017 AdaptationWatch Report. It presents recent work by Romain Weikmans from the Université libre de Bruxelles, and calls for improved reporting guidelines for climate finance information and support for developing countries to aid with UNFCCC reporting requirements. The policy pointers from the report are provided below. Download the full text from the right-hand column for more detail. Non-Annex I countries take a variety of approaches to reporting climate finance information in their Biennial Update Reports (as shown in the table below, taken from page 2 of the briefing). Some countries choose to report finance recieived on a by-project basis, while others report by donor contry or thematic area. In terms of allocation channels, information is included about bilateral and mutlilateral sources with varying degrees of specificity; this is is an especially complex issue for multilateral finance, which may flow through climate-specific funds, funds under the guidance of the UNFCCC, or multilateral development banks. Sectoral information and information about the financial instrument used is also sometimes provided. information was provided to be adequately compared. There is a need to understand why many non-Annex I countries have not submitted or not complied with requirements for the Biennial Update Reports. Support should be provided to identify issues and assist with this process. Common reporting approaches must be adopted that include guidelines for information reporting categories, as well as underlying definitions, methodologies, and assumptions. The UNFCCC should work closely with non-Annex I countries to develop suitable guidelines that are within the capacities of the various Parties. Romain Weikmans, Université libre de Bruxelles, Brussels, Belgium. Weikmans, R. (2017). Climate Finance Received - An Analysis of Biennial Update Reports. AdaptationWatch Weekly Briefing.